Garbanzo field with alfalfa mosaic virus, May 2015, Yolo County. This disease is vectored by aphids (pea, cowpea, and green peach) with alfalfa the common host of the virus. One usually won't see aphids in garbanzos, as after they land and feed (and introduce the virus) they either die or leave, due to the acidic exudate of the garbanzos that deters them. This is why you see a scattering of plants infected throughout the field without any pattern; it just depends on where the aphids land and feed. It is not cost effective to spray the aphids for virus control; instead, planting date is important to avoid aphid flights. The best time to plant garbanzos in California is November 15 to January 15 to take advantage of winter rainfall for irrigation. Garbanzos can also be planted in the spring from April 20 through May. These later plantings (for both winter and spring seeding times) are needed to help avoid the seed corn maggot, a serious pest of beans, and aphid flights that can vector a number of devastating viral diseases. 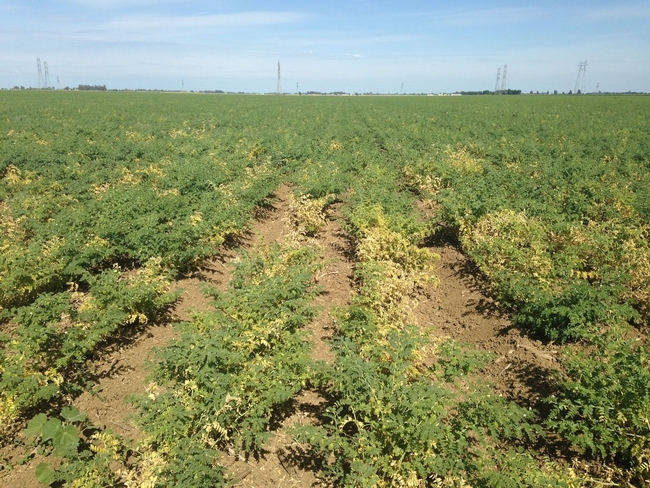 In addition, avoid planting garbanzo beans adjacent to alfalfa fields, a significant host and source of alfalfa mosaic virus.